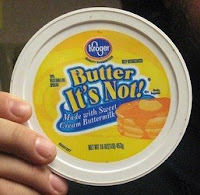 Unbelieveable: This is NOT Butter! So, I got an email last week from Jon Acuff. Actually, it was a reply to an email that I sent him earlier which, among other things, shamlessly hyperlinked a post I wrote about Sky Mall Catalog. Anyway…his reply was to let me know that he would be linking that post to his post, The hate mail mongoose (Or the pastor’s gift guide). Needless to say, I was pretty excited about the possibility of all those hits on my blog. (Why I would be excited about such self-aggrandizement* is something I should probably pray about.) But regardless, I began to think of ways to write a post that would be more “Jon Acuffish”. But then it occurred to me that the reason I like “Stuff Christians Like” so much is that it’s Jon being Jon. Funny, transparent, often profound, often gooberish Jon. So, for me, trying to write something like an SCL post would be as pathetic as the knock-off grocery store margarines trying to imitate “I Can’t Believe It’s Not Butter!” with products like “You’d Think It’s Butter!”, or “Butter, It’s Not!”, or “Tastes Like Butter!”, or, my new personal favorite from my peeps on my mother’s side of the family: “Unbelieveable…This is not butter!” (Note the extra “e” in “unbelieveable” –That just CRACK S ME UP!) Sorry, I’m easliy amused. P. P. S. – Angela, if you’re reading this, I’m afraid this post might edge out yours for the most hyperlink codes in a single blog post. And because you were the lone SCL commenter who came to my rescue in my hour of need, you deserve all the credit or the blame — depending on your perspective. Okay…that’s all I got. Thanks for your time. I know you’ve got other blogs to read! If you’re looking for some really good ones, just check out the ones on my sidebar — I dig ’em the most!